VCJ: What were your thoughts upon learning that you are captain of the New York regional team? VCJ: How did you prepare physically and mentally for the tour, first as a player and secondly as captain? Andre Kirton: I felt like I am always mentally ready for cricket. I think about cricket all day. I always think about different scenarios I could be in as a player and I play it out over and over in my head. That’s everyday I wake up. Physically I don’t think there was much I could have done in that short space of time. As a captain I went straight to the team list and started looking at the players as actors. Who were best suited for the various roles and how they can benefit the team best. VCJ: You made it to the semifinals, how would you rate your team’s performance? Andre Kirton: I would rate the team 8 out of 10. They were many things we needed to tighten up on and we learnt a lot about ourselves on that tour and I think we will work on our flaws and come back harder the next time around. VCJ: How do you rate your leadership throughout the tour? Andre Kirton: I think I did a good job leading good men. I didn’t have a hard time getting any points across to any of the players. We had a few former test players and I think they were the easiest to get my plans through to. The 12 other players and the coach made my job easier with their willingness to execute the ideas I had. VCJ: You have captained at the club level and now at the regional level have you always seen yourself as a leader? Andre Kirton: I love the challenge of leading, it brings out a different side of me. A side I only see when I’m the captain of a cricket team. VCJ: Would you say that it brings out the best cricketer in you? Andre Kirton: I think it does. It brings out a more mature and thoughtful cricketer than I would normally be. VCJ: Were you satisfied with the players given to you for this tour? Andre Kirton: I was very impressed with the men selected for this tour. They showed lots of maturity and fight. I think everyone knew their abilities and they did well to try and execute that but things just didn’t fall on our side of the table. I expressed to them in a meeting after our lost in the Semis that I would go to battle with them anytime. VCJ: I know that you were quite pleased with your troops, but any thoughts on having Randall Wilson, Keifer Phill Prashanth Nair or even Noshtush Kenjige who actually played for South West as part of this tour? Andre Kirton: I think those are all great players and would be great additions to the squad but I’m not apart of the selection committee so I can’t comment on the selection process. VCJ: how excited are you about the prospect of national contracts from United States of America Cricket Association (USACA)? VCJ: The national tournament was put together at short notice, would it be more useful if events like these are on the annual cricket calendar as has been in the past? Andre Kirton: I would love to have more time to prepare for tournaments like this and I think the selectors would also. They can have a short list of guys they can look at over a few net sessions and then they would be able to select the best team to tour with. As a captain, it would also give me more time to see the guys and what sort of form they are in. VCJ: We spoke about your captaincy and your team’s performance how do you think you did as a player this tournament? VCJ: The USA national team is a very competitive space and even more so when it comes to your main trade as a left arm orthodox bowler, how do you see yourself as it relates to the national team setup do you have any aspiration of representing the country at the senior level? Andre Kirton: I’ve always had hopes of representing the USA senior team since I came out of the USA U19 team in 2006. I thought I had a few good years where I was hoping to break into the team but it didn’t happen. I’m not relying on my experience and some good performances to get me there now. I’m happy the team is tough to get into because it means we have many good players doing well and that’s how we need the cricket in the USA to be. VCJ: What is Rusty like outside of cricket? Andre Kirton: Outside of cricket I am a family man. I love to spending time with my kids and my lady. I love to be outdoors, so we spend a lot of time fishing and I’m now starting to get into hunting so I’m excited to master that as well. VCJ: You have possibly at least ten years of good cricket left in you, what is in store once you are done playing? 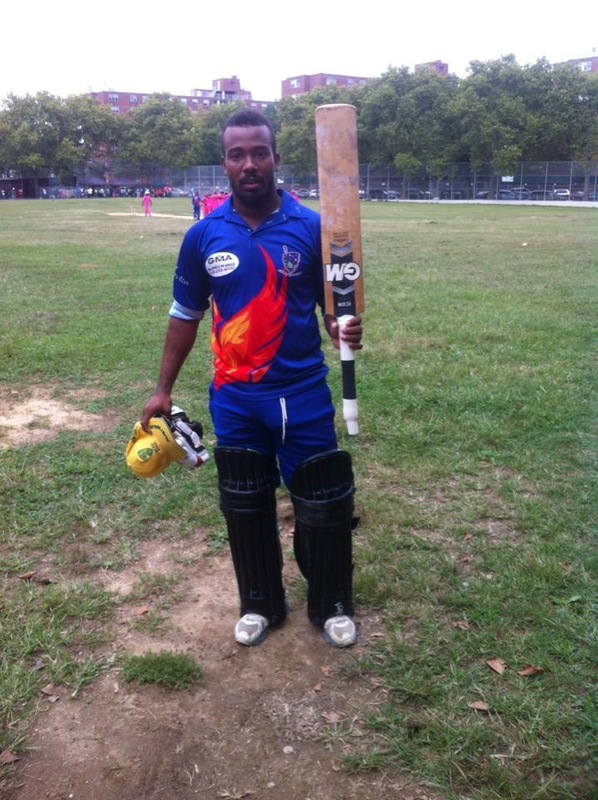 This entry was posted in Headlines and tagged Abdullah Syed, Akeem Dodson, Andre Kirton, Andre Kirton Jr., Derick Narine, Francis Mendonca, Javein Thomas, Jermaine Lawson, Keifer Phil, Leonidas Kirton, Mark Tyrell, New York Cricket Region, Noshtush Kenjige, Prashanth Nair, Rafeek Nazeer, Randall Wilson, Trinson Caramichael, Xavier Marshall. Bookmark the permalink.